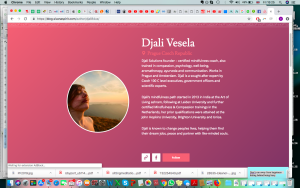 Founder of Djali Solutions (www.djali.solutions), is a certified mindfulness coach trained in mindfulness, compassion, coaching, psychology, well-being, aromatherapy, ayurveda and communication. Djali works both in Prague and Amsterdam. Djali is a sought after expert by Czech 100 C level executives, government officers and scientific experts. Djali has been involved in mindfulness since 2013, having started her experience in India at the Art of Living and then continuing through Leiden University and certified Mindfulness & Compassion training in the Netherlands, prior to which she got trained in Communication and Psychology at the John Hopkins University, Brighton University and Unisa. Djali is known to change peoples lives, helping them find their dream jobs, peace and partnering with like-minded souls. Djali also writes mindfulness, wellbeing and lifestyle articles.